The Peanut/nut Sheller produced by us is an easy operated peanut shelling machine based on years' experiment and practice, capable of shelling 400, 800,1500, 2500, 3000 kilograms of raw, sun-dried peanuts per hour. 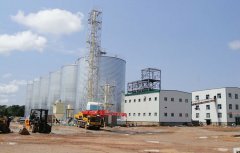 It requires 2.2, 4, 7.5, 11,15 kw power at different capacities to use, and can be matched with elevator for feeding material and peanut cleaner to remove the dust and impurities in raw materials. The environmental protection peanut shelling system composed by peanut cleaner, feeding elevator and peanut sheller serve as a small combination of peanut shelling line. It accepts a wide range of nut sizes without adjustment. If necessary, adjustment is quickly and easily done. The life expectancy of the machine is long if suitable keep. Traditional shelling in developing countries is done by hand or by some form of mortar and pestle and thus requires a lot of labor. 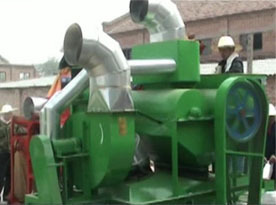 With the peanut sheller, the user loads the desired crop at the feeder downside. Then start the machine, the fan creates centrifugal force, which pushes the nuts upside of the feeder automatically. There, the nuts are pulled down by gravity. As they descend, the gap of the roller cylinders gradually narrows. The shell of each nut is broken at the point where the gap is sufficiently narrow and the rotor motion causes sufficient friction to crack open the shell. The tapered gap allows a range of nut sizes to be shelled. The kernels and shell fragments fall into the output of material and are later separated by winnowing. The device works best for jatropha curcas, shea, dried coffee, and peanuts (groundnuts). 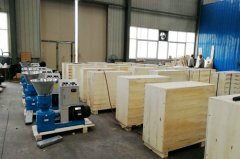 The peanut shelling machine need feed material by labor first and automatically feed by wind fan connected to the machine. The fan automatically winnows the harvest (separates the shells from the nuts). The peanut shelling machine are capable of shelling the same variety of crops such as jatropha curcas, shea, dried coffee etc. The processor also provides access for the winnowing section to be used independently from the sheller. 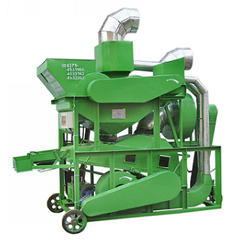 This allows winnowing of crops that are not shelled, such as rice, maize, sorghum etc. The second component of our system is a device that separates the shelled kernels from the shells. Prior designs for separation equipment use forced air to carry the shells away from the kernels. Since forced air requires complex fan units and extra power, we designed a separation machine that does not depend on air currents. Our design uses the round property of the kernels to separate them from the husks. The round kernels roll in contrast to the shell fragments, which are flat and may have fibers sticking out at the broken edges. Our separator places the combined kernels and shells onto an inclined plane where the round kernels roll down the plane, and the shell fragments stick on the sloped surface. In places like Haiti and many West African countries, peanuts are a major crop. Most peanut farmers shell their peanuts by hand, an inefficient and labor-intensive process. TThe peanut sheller is small and inexpensive. It fits well into the household peanut industry, which is to serve technologically where peanuts are grown, processed, and marketed. The simple, low-cost peanut sheller is economical for use by households and small workshops. 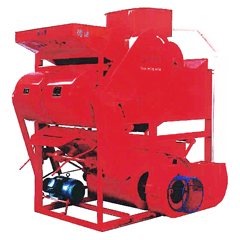 The peanut sheller, with sufficient market penetration, would offer a substantial increase in shelling efficiency. Most shelling is done by hand in peanut-producing regions of the developing world. 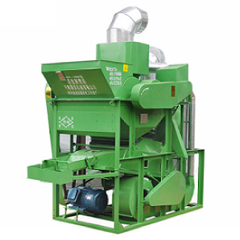 The peanut sheller of our products feature low-cost, easy operation and high efficient. 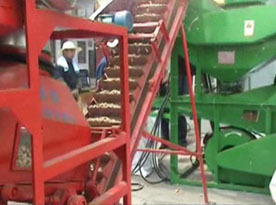 The peanut sheller could significantly reduce peanut processing time for the worker, opening up time for other tasks. 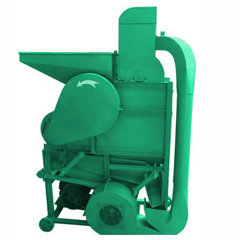 The peanut sheller could be applied in peanut process workshop for industrial production. It is advanced in technological progress and agricultural innovation for many parts of developing world. 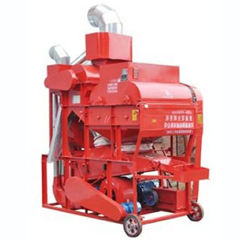 We are a professional machinery company offers nut seeds cleaning equipment, vegetable cleaning machinery, grain and seed cleaning equipment from China. Our goal is to serve advanced peanut processing technologies for customer. 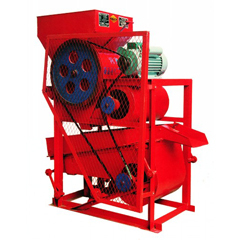 We are professional in the equipments for peanut shelling, oil pressing, and other general grain machinery. 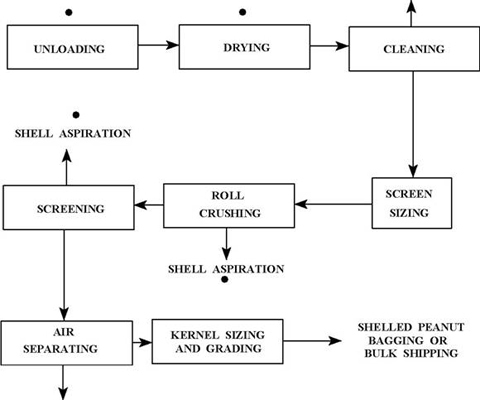 A typical shelled peanut processing flow diagram is shown as the following. Shelling begins with separating the foreign material with a series of screens, blowers, and magnets. 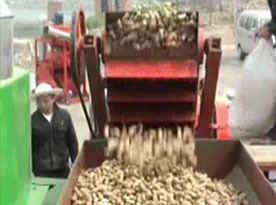 The cleaned peanuts are then sized with screens (size graders). Sizing is required so that peanut pods can be crushed without also crushing the peanut kernels. Next, shells of the sized peanuts are crushed, typically by passing the peanuts between rollers that have been adjusted for peanut size. The gap between rollers must be narrow enough to crack the peanut hulls, but wide enough to prevent damage to the kernels. A horizontal drum, with a perforated and ridged bottom and a rotating beater, is also used to hull peanuts. The rotating beater crushes the peanuts against the bottom ridges, pushing both the shells and peanuts through the perforations. The beater can be adjusted for different sizes of peanuts, to avoid damaging the peanut kernels. Shells are aspirated from the peanut kernels as they fall from the drum. The crushed shells and peanut kernels are then separated with oscillating shaker screens and air separators. The separation process also removes undersized kernels and split kernels. Following crushing and hull/kernel separation, peanut kernels are sized and graded. Sizing and grading can be done by hand, but most mills use screens to size kernels and electric eye sorters for grading. 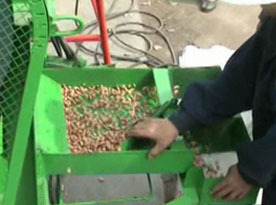 Electric eye sorters can detect discoloration and can separate peanuts by color grades. The sized and graded peanuts are bagged in 45.4-kg (100-lb) bags for shipment to end users, such as peanut butter plants and nut roasters. Some peanuts are shipped in bulk in rail hopper cars.